ASI created this SUP sport specific water safety rescue award specifically for stand up paddle instructors and anyone who paddles regularly. Provide SUP Instructors with skills and knowledge to perform simple rescues in SUP enclosed flat water and exposed waters locations. Coastal locations and inland bodies of water and harbours over 1 km (0.6 miles wide) No breaking waves. 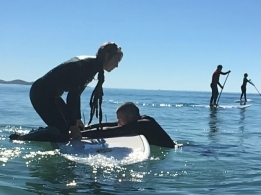 Water safety and rescue skills for Stand Up Paddle Instructors. Attending a workshop (proficiency). Australia only. Attend practical - completing mission and in-water rescues. This intensive 5 hour workshop is ideal for people who are comfortable in the water and can swim 100 metres without stopping and prone paddle effectively. Australia only. This is for people who have previously completed the ASI SUP Safety Rescue Award (Flat) within the previous 12 months. The Certificate is valid for 24 months (or 12 months in Australia) from the date you completed the workshop. There is no renewal on this qualification. To obtain a new certificate, participants complete the course again.